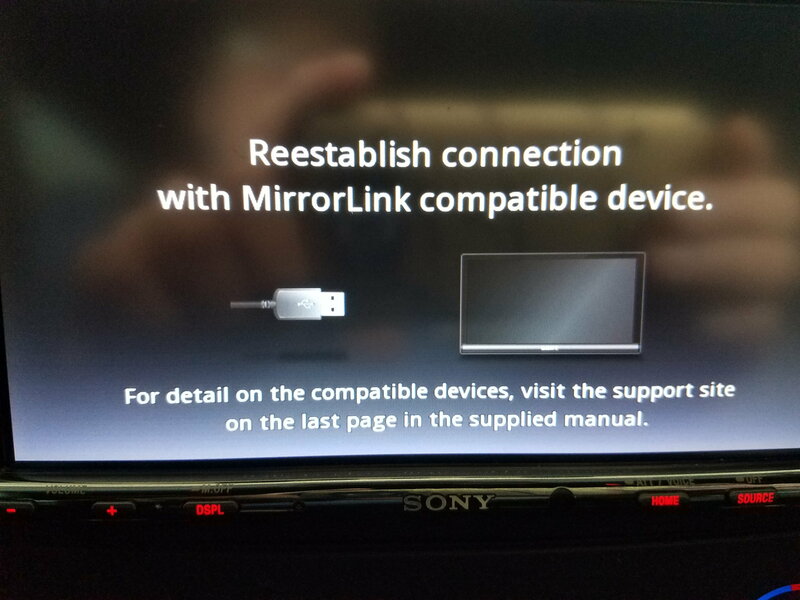 I installed a Sony XAV-712HD in my car and have a Samsung Galaxy s7 and cannot get the mirror-link to work. I've read that I need another app to make this happen but no idea of what that other app is. Anybody have a clue? Android Auto and Apple Carplay are the general mirroring apps used. That head unit doesn't support Android Auto and your Galaxy S7 doesn't support the MHL connection for which Sony supplies the connecting cable. Your only option (other than ordinary Bluetooth) is MirrorLink. To do that you need to connect your phone to the head unit with a USB cable then go to Settings on your phone and search for MirrorLink then select connect via USB. Yes OK I followed the instructions exactly and this is a picture of the message on the radio screen. My Phone also says that I need an Mirrorlink app. 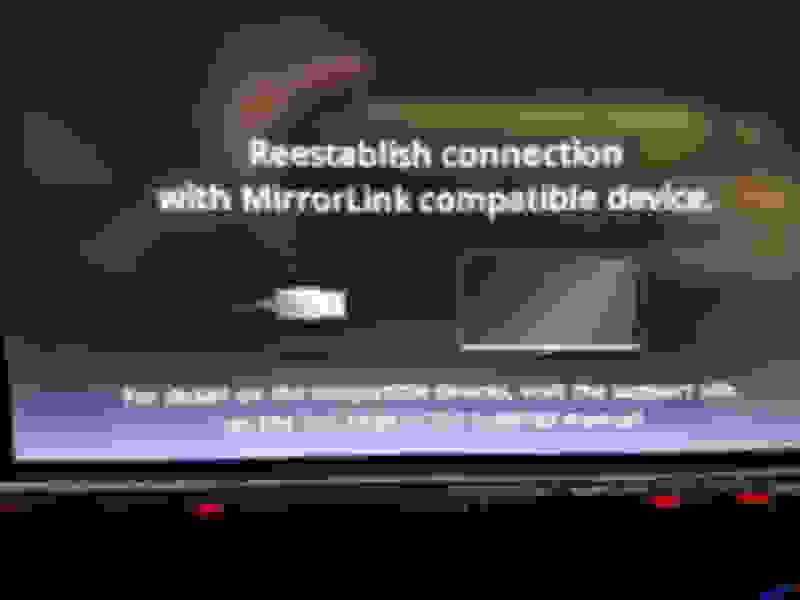 Yes, you need to install a MirrorLink app. Samsung has one called Car Mode but everybody seems to hate it. MirrorLink themselves published one called RockScout. There are a few others as well - check on Google Play by searching "MirrorLink". Thank You. I did try car mode but it only gave me audio. I will try the RockScout. I do not see anything that is a mirrorlink, that is that it will display on the car stereo screen what is on the screen of the phone. That is a common problem according to the reviews on Google Play. Lots of people say they get nothing but black screens or can't connect at all. The technology just isn't there yet using MirrorLink. Android Auto seems to work better but isn't available with your particular Sony head unit. You could add a MiraCast box but they don't get glowing reviews either and they have the added problem that all screen data is treated as video which most head units block while the car is moving. You'd have to find some bypass for the head unit to get the display to show the phone screen while you were driving. You could upgrade to a different brand of phone to get the MHL compatibility that Sony supports or if you like Samsung you could downgrade to an S6 which did support MHL. Other than that, there isn't much available to get the two pieces you have to talk to each other. Thank You WhiteBird. I'm about due for a new phone anyway. I guess I'll do some research on a MHL phone. I tried using mirrorlink with my LG G6 and my pioneer head unit with no success as well even after downloading the app. When I get a head unit for my daily im gonna make sure it has android auto as that seems to work much better. My 2018 equinox's radio comes from the factory with android auto capability and it works great.